Well, I hope you have enjoyed this week of catalog cases as much as I have enjoyed showing them to you! It's an easy way to get those creative juices flowing when you hit a slump. Today's sample was taken from p. 58. It's a very simple and easy layout, but still elegant! 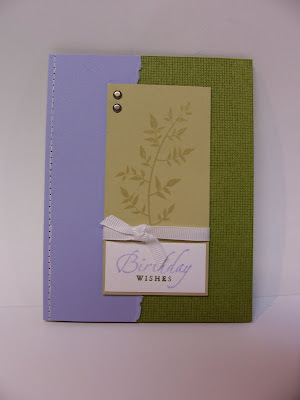 The sentiment is markered to achieve two colors on one stamp, and the left edge is faux stitched. I used the mat pack and piercer to make the holes, then used my white gel pen to "connect the dots". The amethyst layer is torn to add a little texture. Thanks for joining me this week!